I’m adding the <initialize> pipeline processor shown above after WFFM’s though theoretically you could add it anywhere within the <initialize> pipeline. The poster had asked if there were an easy way to disable the attachment of files on emails sent by the Web Forms for Marketers (WFFM) module in Sitecore. After quickly peeking in the WFFM assemblies, I gave a potential solution — check out the thread to see what it was — though it did not work. The class above inherits from Sitecore.Form.Submit.SendMessage in Sitecore.Forms.Custom.dll, and overrides the ExecuteMail() method — this method is declared virtual in Sitecore.Form.Submit.SendMail which is the base class of Sitecore.Form.Submit.SendMessage. As you can see, the images were attached this time. 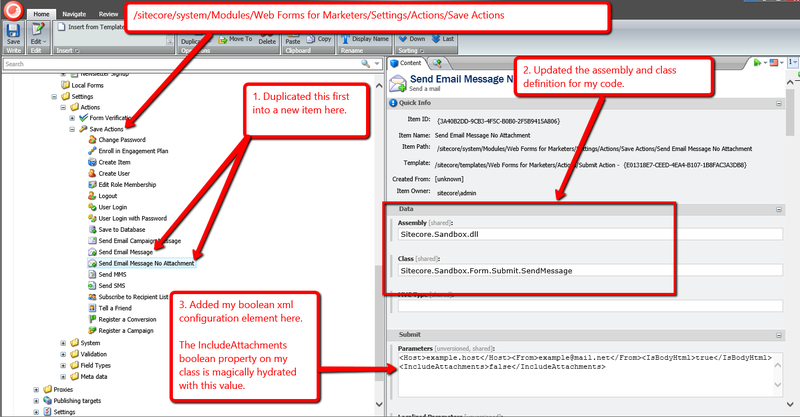 No doubt you have heard the latest version of Web Forms for Marketers — better known as WFFM — now works on Sitecore MVC — don’t know about you but I am quite excited over this! Plus, as an added bonus — and this made my day when I installed it 😀 — you can change most of the rendered markup for forms in Views that ship with the module (these are installed into ~\Views\Form\EditorTemplates\ of your Sitecore instance). 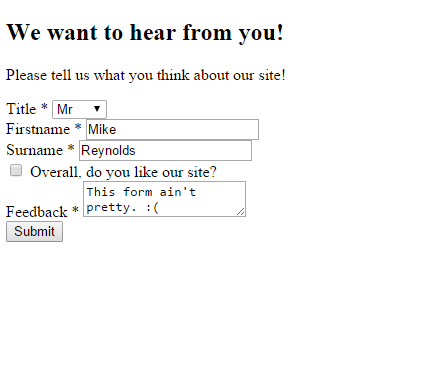 Unfortunately, the value of this field is not being put into the value attribute of the submit button in the View above. 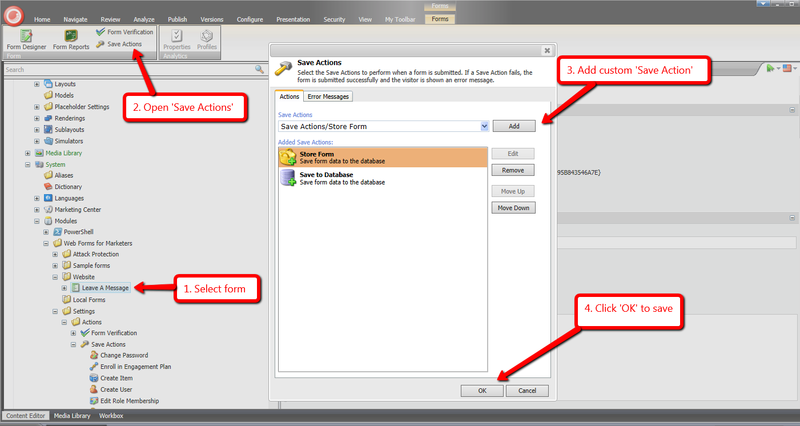 As you can see, the value of the submit button text field is set on a property of the model, and can be easily be put into the value attribute of the submit button. 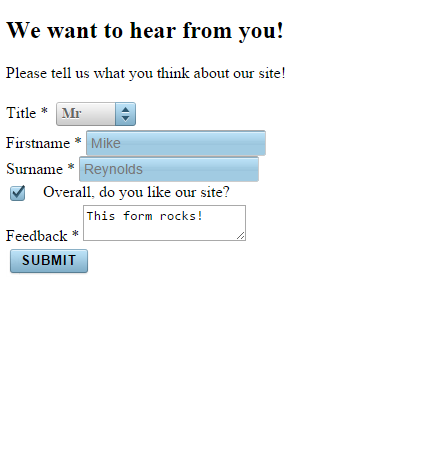 Recently on my About page, someone had asked me how to show submitted form field values in Web Forms for Marketers. I had done such a thing in a past project, and thought I would share how I went about accomplishing this. This solution reuses an instance of a storage class I had used in a previous post. The class above basically serializes a supplied object, and puts it into session using a key given by the calling code. Plus, you can remove objects saved in it using a key. 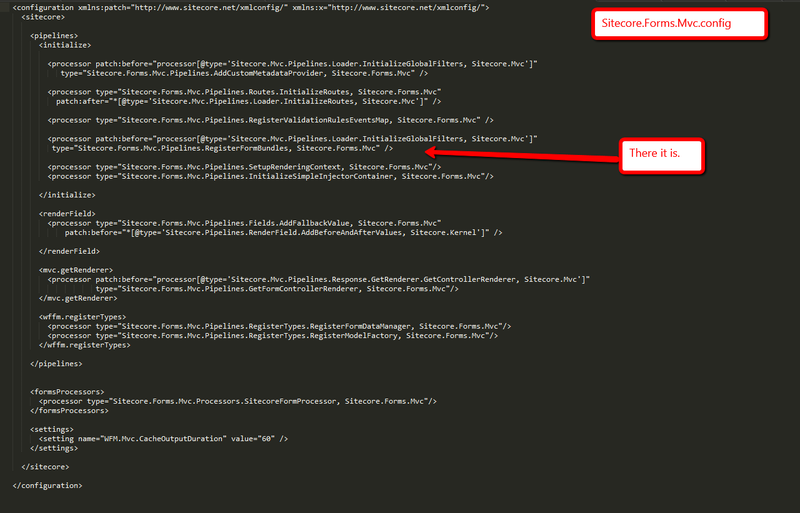 I modified this class from the original version: I declared the constructors public so that I can reference them in a Sitecore configuration file (you will see this configuration file further down in this post). The code-behind above gets the FormSubmission instance from the IRepository instance defined in the configuration file shown above, and passes the Field POCO instances within it to a repeater. One thing to note: the solution above only works when your Web Forms for Marketers confirmation page is its own page, and you set your form to redirect to it after submitting the form. If you have any thoughts on this, or know of other ways to show submitted Web Forms for Marketers form field values on a confirmation page, please share in a comment.